British beauty label The Body Shop first launched its English Dawn White Gardenia range in 2014, as a make over for its original White Gardenia Range. From its line ‘Fragrances of the World’, English Dawn White Gardenia is limited edition and arrives in store during the Spring season, the White Gardenia season. The EDT opens with notes of Bergamot at the top, dwells into Tuberose and White Gardenia in the heart, and wraps itself with a base of Sandalwood. It is a very fresh, very feminine scent, unlike other gardenias which may leave a ‘grandma’ impression. The scent is not at all overpowering, though light, leaves a delicate charming impression, and may remind you a fresh spring dawn, or a lovely spring wedding. It has that vintage, very British feel to it, like a garden tea party decorated with many flowers, and captures the very essence of white gardenia with perfection. The floral scent for me starts off with a slight citrus burst, perhaps which is what attracts me as I am a citrus lover, and bursts into beautiful white gardenia, and then dances down to a soft sandalwood. The Body Shop White Gardenia can be classified into a work-friendly, pretty scent, even a romantic one, perfect for a first date when you want to leave an elegant impression. The alcohol used for this fragrance is Community Fair Trade organic alcohol made from sugar cane, which might explain as to why this scent doesn't last forever, and is good for a few hours. You may layer it up with The Body Shop White Gardenia Lotion and Shower Gel for a lasting fragrance, or touch it up again for a fresh burst of gardenia. It is a decent scent, perfect for Mother’s Day or gifts to colleagues, bosses and friends, and slightly is similar to Chanel Chance and Michael Kors, perhaps because of the tuberose notes. 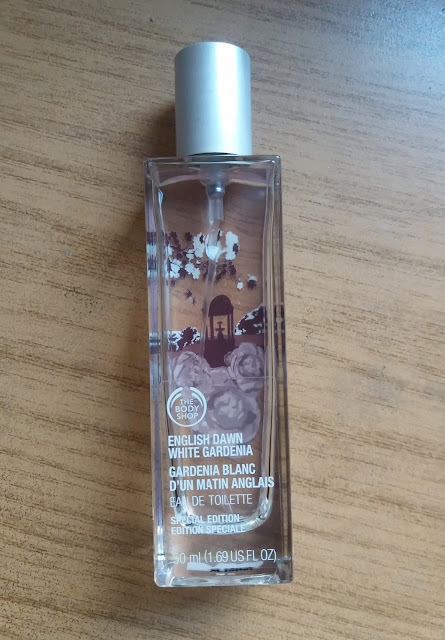 The Body Shop English Dawn White Gardenia ETD comes at a price of £18 and is available from March to May at all The Body Shop outlets and online.